This is an open edition print from a watercolour and ink on paper original, which I had made into greeting cards but also liked as a larger picture and so also have available in this format. The picture has 3cm margins (4cm bottom) so please note that the full paper size is 32.4 x 23.8cm. Let me know if you would like information on the greeting cards. 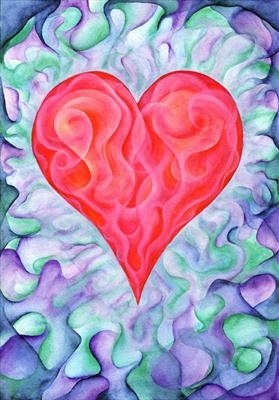 This is one of a series of painting that were intended as greeting card designs. The paper used here has a different finish to that of the cards (matt as opposed to satin) and gives a really fantastic intensity of colour.